This did my heart some good to see! A sweet little friend of ours turned 6 this weekend, and we had a blast celebrating at a pool party today. After we sang Happy Birthday, I thought I’d pull out my camera and take a few snapshots of the party guests enjoying their cookie cake, and here’s the first photo I captured, from a distance. 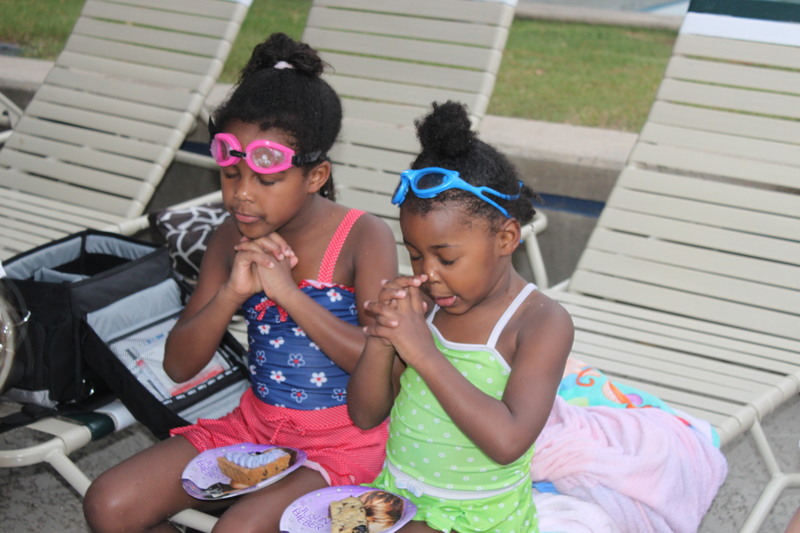 My sweet girls, pausing together – unprompted – in the midst of the commotion around them – to thank God for their food. It’s my reminder to make sure that we keep praying with them – even though sometimes (especially at night) I feel too tired to do a bedtime routine that includes prayers. Helping them form the right habits when they are young will serve them so well in life, and talking to God – anywhere at anytime – is one habit I definitely want them to have. Previous PostPrevious Our first vegetable harvest! Next PostNext Someone said the “s” word!